Beautiful Lakefront Ceremony at the Reflection Bay Golf Club at the heart of Lake Las Vegas. Gorgeous grounds with Spectacular views to the lake, surrounded by palm trees, a sandy beach and a pristine golf course. After the fabulous lakeside ceremony the guest took a ride on the La Contessa yacht around the lake, while we were taking pictures with the couple at the golf course, and had a champagne toast to the new couple before returning to the clubhouse for the reception. Julie Reed events provided the nice columns for the ceremony and the flower arrangements for the bridal party and the reception. 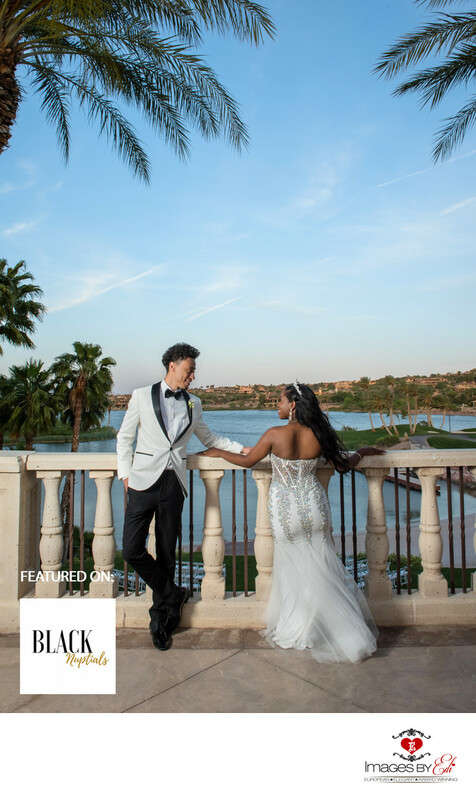 The wedding was featured in 2017 on Black Nuptials Wedding Blog.